Meltdown is non-stop energy the entire album through with fast paced garage rock and surf punk inspired riffs. The straight-forward sound has numerous, perhaps obligatory, references to spiders and makes clear its dark themes. The lyrics and occasional chiming in an eerie organ may seem an appropriate tribute to an old sci-fi film score never given its due credit, yet while one can imagine a disutopian future in “Skull Eyed” and “Meltdown”, the album would be worth listening to solely for the call to arms “Fall in Line”, “Join us Now”, and “Wait for Us”. 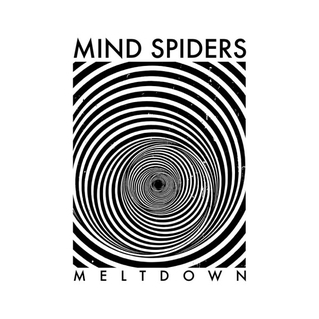 Similar to the Misfits, Mind Spiders don’t take themselves too seriously and this translates into lighthearted and fun listening. Other noteworthy tracks include “You are Dead” and “Beat”. Check this video if you don't believe me. Mind Spiders - "Wait For Us" from stereogum on Vimeo.